The Atlantic Old English 3" x 2.5" x 2.5mm thick ball bearing hinges with a Matt Gun Metal finish are durable and stylish, and, at the same time, extremely practical. Using 3 hinges they will hold a door up to 40kgs. The 3 hinges will prevent warping and twisting of the door, holding it at the top and bottom and in the middle. 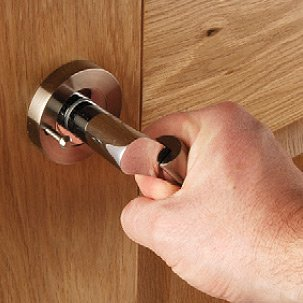 This ball bearing hinge has a nice, smooth operation and is suitable for standard 35mm thick internal doors. It is slightly wider and thicker than a standard hinge for a 35mm thick door which is usually 3" x 2" x 2mm thick. The extra 0.5" width makes it stronger and the extra 0.5mm thickness allows the hinge to sit slightly deeper into the edge of the door, giving it a firmer footing. It is often used to replace old 3" x 2" x 2mm thick hinges; just requiring a little additional cutting out. This Atlantic Old English hinge is made from steel so is suitable for internal use only. It is finished with a quality Black nickel finish which matches the finish of many of the Old English door handles on rose. Bathroom turn and release sets and key escutcheons are also available in the same finish, making for a wonderful cohesive look on the door. To complete the whole look, mortice latches, for the doors you do not wish to lock, are also available in this spectacular Black Nickel. See the related products on this page for matching products in the Atlantic Old English range.